'The Choice' by Nicholas Sparks presses its readers with the question -'How far would you go to keep the hope of love alive?' The story in the book dwells on how the choices we make, even the smallest and insignificant ones governs the course of our life. It is about love, faith and trust and the choices we can make in our life to show them. The story is starts with Travis Parker visiting her beloved in a hospital and he has been doing so for several weeks now. He has a big choice to make in the days to come that will be the defining point of his life. He is torned between the voice of his heart and the promise he had made to his wife. What will he choose? The story then flashes back to his past years when he had met Gabby. Eleven years back Travis Parker was a single man content with the life he lived. He had great close friends, a faithful dog, a dream house and a decent job. He had dated a lot of women but none of those turned into a serious relationship. In fact, he had come to believe that a woman in his life will only disrupt his lifestyle for he loved adventurous sports and few women would share the same enthusiasm about such sports in their daily life. It was when Gabby Holland moved in the house next door, things in Parker's life changed. Gabby had been indifferent to Parker's attempts to be friendly at first. She had a boyfriend for the past 3 years and was sort of content with it. In fact, she had moved to North Carolina to be nearer to him. It was when she suspected that her dog was pregnant and that she thought Parker's dog was responsible for it, she stormed into his house. Days that followed only brought them closer and finally both of them made the choice to be together for the rest of their life and that choice had governed their life, till this day. Today, he was the one who had to make the choice. And he was in a dilemma. Sparks has intensely dwelled on Parker's feelings and thoughts and how he fights his own self to make a decision. But, for the fact that I had read Spark's The Notebook only a month back, I found the story lines to be strikingly similar and that lessened the beauty of the story for me. In both books, the story is set in the beautiful small coastline town of North Carolina. Heroes in both stories had a liking for small town life and the pleasures that it offered. In both stories the heroine had left their previous boyfriend for the hero and something bad happens to them in the end! That is a lot of similarities by any standard. I was only happy to see how the story in 'The Choice' ended and that made up a little for the disappointment I felt earlier. It is an achingly moving love story. 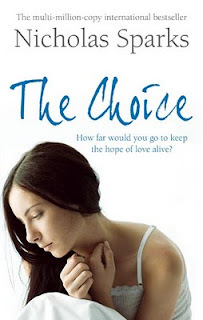 My only word of caution to others is - If you have read 'The NoteBook' recently keep a considerable gap of time to read 'The Choice' and vice versa. Interesting comment you make about this being similar to 'The Notebook' which I have read and found very sickly sweet! I think then this title will not be going on my wishlist, thanks for the review Jyoti.